We have discussed several times regarding the intention of the FBI to create a special unit for internet monitoring and surveillance, a task force established to prevent and fight cyber crimes .In reality the Bureau already has different internal units that work with the same purpose and in the last years has promoted different projects for the development of tools and applications for the web monitoring. The FBI has recently created a secret surveillance unit to project and develop technologic tools and software for Internet and wireless communications monitoring. FBI is considered one of the most active agencies in this sense, in the last months it has publicly requested the design of a real time monitor for social networks that have to be able to identify suspect behaviors that could be interpreted as indicator of presence for an ongoing crime. The FBI has trying to maintain maximum reserve on the Unit called the Domestic Communications Assistance Center, for which the Senate committee has already allocated $54 million assigning to it the mission to create technologies for law enforcement to intercept and analyze communications data. The power conferred to the unit is wide, every single communication through social networks and over internet in general should be intercepted by the hardware platforms and software applications that the the unit have to implement. The main problem is related to rapid technological evolution that make obsolescent surveillance systems in short time, due this reason the request of FBI to include a backdoor in any products that could be involved in communication, like social networking and also online games consoles. While progress is expected through DEA’s participation in the recently established Department-wide Domestic Communications Assistance Center (DCAC) led by the FBI to address the growing technological gap between law enforcement’s electronic surveillance capabilities and the number and variety of communications devices available to the public, the foremost challenge confronting U.S. law enforcement is the diminishing ability to conduct lawful electronic intercepts on current and emerging communications technologies as communications providers continue to offer new and improved services and features to customers. Addressing this issue is critical to maintain law enforcement’s ability to conduct lawful criminal intercepts. The position of the US authorities is worrying, they want to impose to every internet service provider to give full access to Government for surveillance purpose, according the amendment to CALEA, the Communications Assistance for Law Enforcement Act. Contrary to what one might think about the news there is no noise, no political debate, confirming a will that seems a common intent. To confirm that the FBI is allocating new skilled personnel to the unit a job announcement for the DCAC has been published with a deadline of May 2. Analyzing the announcement we can have an idea on the technological skills requested, such as a meaningful experience with “electronic surveillance standards” including PacketCable, QChat and T1.678 (VoIP communications). 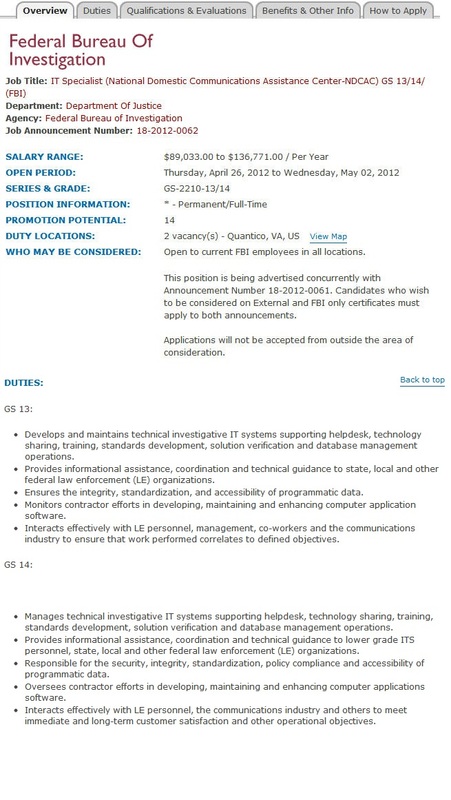 One required skill for the position, which pays up to $136,771 a year, is evaluating “electronic surveillance solutions” for “emerging” technologies. The NDCAC will have the functionality to leverage the research and development efforts of federal, state, and local law enforcement with respect to electronic surveillance capabilities and facilitate the sharing of technology among law enforcement agencies. Technical personnel from other federal, state, and local law enforcement agencies will be able to obtain advice and guidance if they have difficulty in attempting to implement lawful electronic surveillance court orders. It is important to point out that the NDCAC will not be responsible for the actual execution of any electronic surveillance court orders and will not have any direct operational or investigative role in investigations. It will provide the technical knowledge and referrals in response to law enforcement’s requests for technical assistance. The project is really ambitious and without doubt it will involve all the main intelligence agencies of the country, such as Drug Enforcement Administration and National Security Agency. NSA also is massive investing in monitoring technology, a couple of months ago we have learned that the agency is building the country’s biggest Spy Center in the little known city of Bluffdale. The center, named Utah Data Center is under construction by contractors with top-secret clearances. 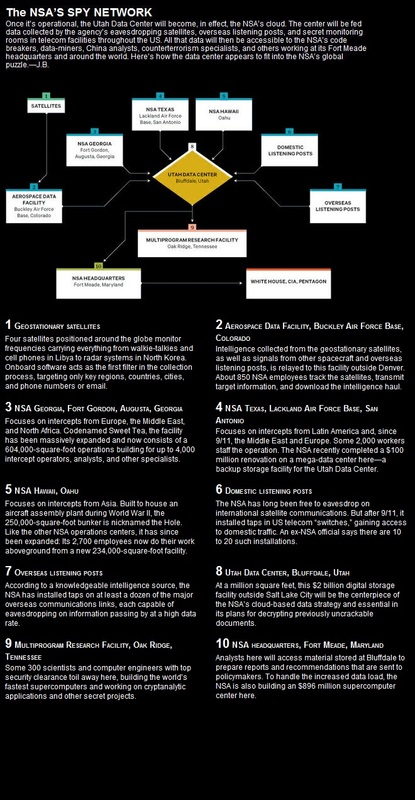 Its purpose is to intercept, decipher, analyze every world’s communications under investigation using every kind of transmission. 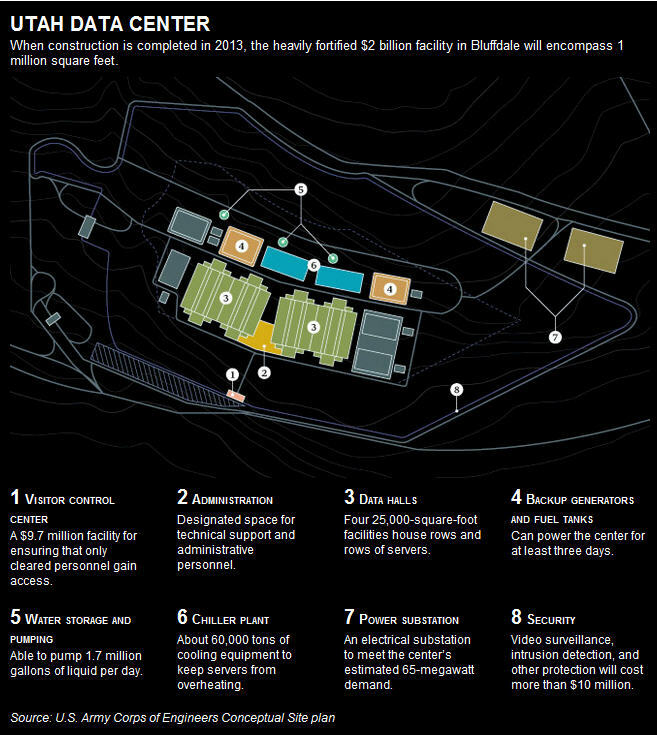 The center will have a final cost of $2 billion and should be operative in September 2013. Its databases will be store all forms of communication, including the complete private emails, cell phone calls, search engine researches and every kind of digital data related to every individual. The imperative is to monitor everything! It’s clear the dimension of the project that has the purpose to cover monitoring need of every type includind of course satellite communication, phone calls, computer data and geostationary satellite data. Once the Data Center it’s operational it will be fed data collected by the agency’s eavesdropping satellites, overseas listening posts, and secret monitoring rooms in telecom facilities throughout the US. All that data will then be accessible to the NSA’s code breakers, data-miners, China analysts, counterterrorism specialists, and others working at its Fort Meade headquarters and around the world. The information I’m proposing should not deceive, in reality the country is already littered with centers for the analysis of data traffic and phone interception that make use of sophisticated software programs that conduct “deep packet inspection,” examining Internet traffic as it passes through the 10-gigabit-per-second cables at the speed of light. One of the main software has been developed by company called Narus and is controlled remotely from NSA headquarters at Fort Meade in Maryland. Any suspicion communication is automatically recorded and transmitted to the NSA for futher analysis. Also other agency are interested to monitoring and surveillance, let’s introduce project sponsorized by CIA, the intelligence agency is now interested to gather information from every intelligent devices that is surrounding us to spy on every US citizen. 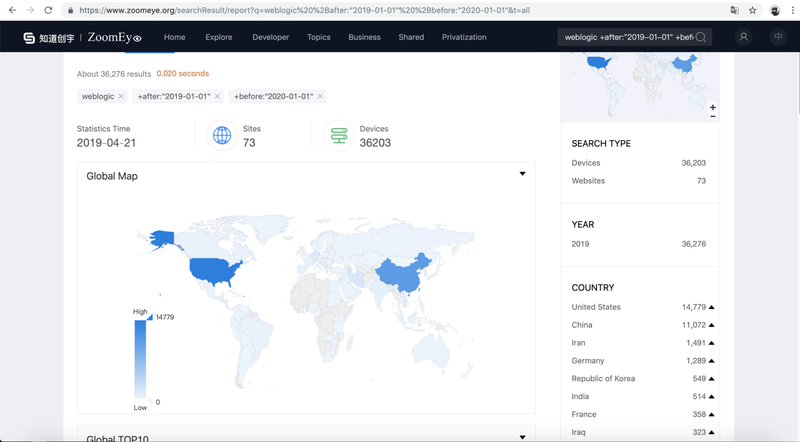 We have introduced months ago a spying project that has the intent to acquire information from gaming platform all over the world, a mine of data to collect and analyze. Let’s me conclude the article speaking of the most interesting part of the web, the one defind Deep Web, that every agency is infiltrating, a volume of data impressive if compared to the ordinary web. the Deep Web represent today a mine of information with high level of interest, this invisible portion of web is considered infact the homeland for cybercrime, intelligence agancies and hacktivists, due this reason it is considered fundamental to be able to control this controversial cyberscenario. In the Deep Web are hidden protected data, government communications and noncommercial file-sharing between trusted peers. It ‘clear that the huge investments mentioned are a blatant invasion of privacy in the name of security, but the scope of the projects suggests that no law or constitution can oppose. What will invent the human intellect to escape this modern form of control?